Our mother’s do so much for us that we could never repay for anything. Nevertheless, it is always important to celebrate every relationship. And the Mother-Child relationship is first to cherish for life. And now we are stepping into that part of the year, where we do everything to celebrate and make our mothers feel special and important in our lives. Yes! It’s Mother’s Day and it’s time to get crafty to give a personalized gift for her. In honor of all the mothers and their beautiful relationship with their child, here are some of the creative and quirky awesome Mother’s Day crafts to do with ice cream sticks with your toddler. Go ahead and have fun this summer. Every mother would appreciate stationery. And when it is from waste and simple materials, they are extra special. Materials Required: Mod podge, design pattern stencil, ice-cream sticks (approximately 35), glitter, hot glue, tin can, and ribbon. Instructions: Apply mod podge on one side of the ice-cream stick. Keep the design pattern stencil on the stick and sprinkle the glitters on the stencil. And now patiently remove the stencil to get the clean design on the stick. Ensure you repeat the process in all the sticks. Take a photo and using the glue, two decorated sticks down as shown overlapping about 1/4 inch over the photo. Repeat the same process with other two sticks and overlap. And make it into frame with four sides. The photo frame is ready to use. Take the tin can and stick the decorated the ice cream sticks using hot glue on the tin. Make a bow using ribbon and stick it on the frame as well as can. Mother’s life in the hustle-bustle of the kitchen. And a recipe holder would be a perfect present for them. Materials Required: Colored ice-cream sticks, heart beads, colored blank cards, permanent marker, and glue. Instructions: Pour the glue generously on the index cards. Take 8 ice-cream sticks and line them precisely, side by side on the gluey index card, along its width. This will become the back of the box. Take 7 more ice-cream sticks and stick them together in a stack, one on top of the other. Create two such stacks of the same size. Stick one stack on each side of the backboard. Take 5 sticks and stick them horizontally from the bottom. Make the bottom of the holder by sticking two sticks one on top of the other at the lower part. Use the wooden heart beads, decorate the recipe holder and write a personal message for your mother. Gift your mom a special photo puzzle this Mother’s Day. 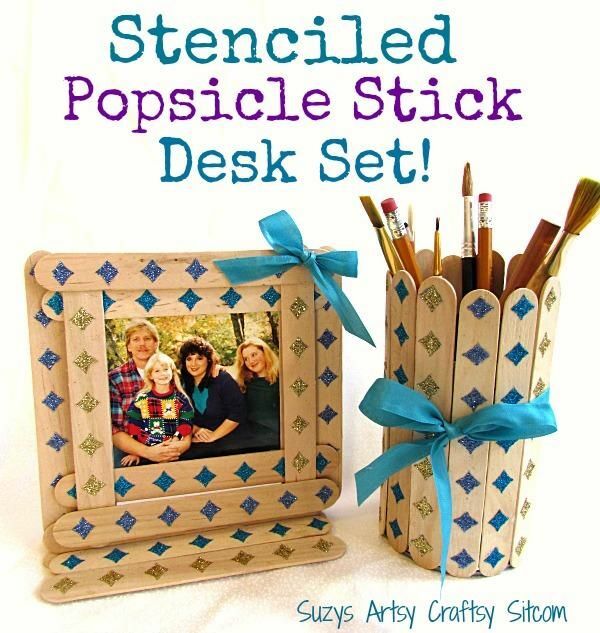 Materials Required: 10-15 large popsicle sticks, 1 x A4 photo, spray adhesive or glue, craft knife, and scissors. Instructions: Place the photo on the plain side and lay the ice-cream sticks in a row across the photo. Depending on the size of the photo, you can select the number of ice-cream sticks. 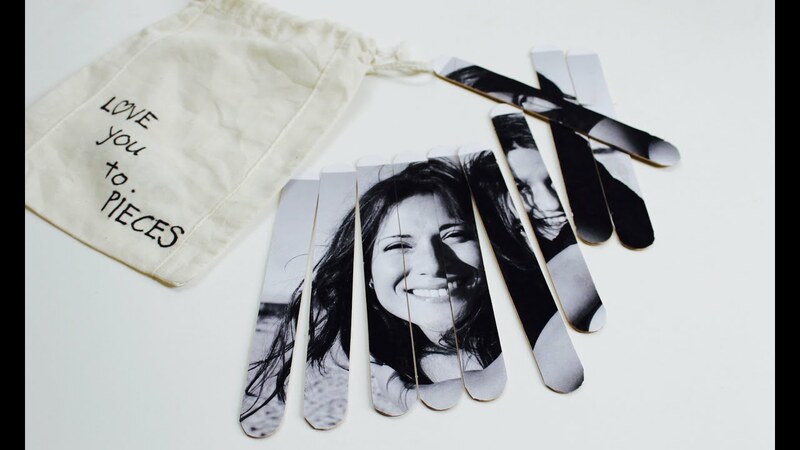 Using spray adhesive or a hot glue gun, stick the ice-cream sticks to the back of the photo. Leave it to dry. Once dried, use a craft knife and cut the photo and trim the ends with scissors. Your puzzle is ready to set and play. Beautiful centerpiece with simple and home available materials are always surprising and best gift to present. Materialss Required: Ice-cream sticks and glue. Instructions: Take two sticks and lay it on the table horizontally. Take two more and lay it on the previous stick vertically using glue. It will look like a cross. Lay the next layer a few millimeters away towards the outside. Repeat the process depending on the size of the vase you want. Leave it to dry. Once dried you can keep the flowers. Flowers always make us happy. A small gesture of a card is priceless for a mother. Materials Required: Small photo, cardboard, paint, paint brushes, glue, scissors, ice-cream sticks, small jar or container, colored tissue paper, and ribbon. Instructions: Color the ice-cream sticks as per your wish and let it dry. Take the photo of the little one or your mother, just cut the face. Cut the cardboard about the same size as per the photo and stick it together and trim the edges. Once both the photo and ice-cream sticks are dried, place the sticks on the backside of the cardboard using the glue, evenly, in a circular fashion. You can paste as many sticks you want on the cardboard. You can cut the ice-cream sticks in different sizes as per your wish. Once dried, turn over and attach a green color painted ice-cream stick as a stem of the flower. Take the jar or container and fill it with colored tissue paper and place the flower inside the jar. 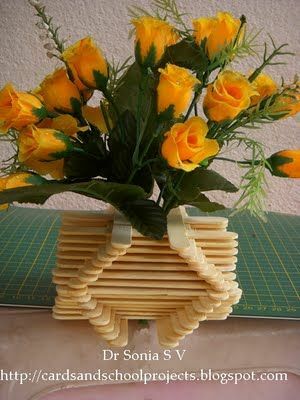 Your simple and sweet ice-cream stick flowers are ready to be kept in the vase made previously.